Of all the many biographies of Theodore Roosevelt, none has presented the twenty-sixth president as he saw himself: as a man of letters. 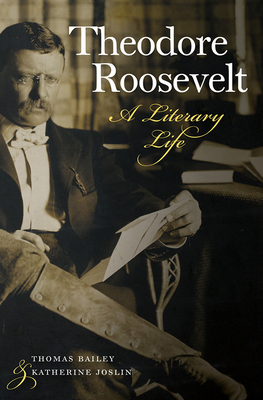 This fascinating account traces Roosevelt’s lifelong engagement with books and discusses his writings from childhood journals to his final editorial, finished just hours before his death. His most famous book, The Rough Riders—part memoir, part war adventure—barely begins to suggest the dynamism of his literary output. Roosevelt read widely and deeply, and worked tirelessly on his writing. Along with speeches, essays, reviews, and letters, he wrote history, autobiography, and tales of exploration and discovery. In this thoroughly original biography, Roosevelt is revealed at his most vulnerable—and his most human. THOMAS BAILEY is professor emeritus of English and environmental studies at Western Michigan University. KATHERINE JOSLIN is the author of Jane Addams, A Writer’s Life and Edith Wharton and the Making of Fashion, winner of a Choice Outstanding Academic Title award.